Does the end justify the means? In the case of the atomic bomb attack on Hiroshima, there are compelling arguments both for and against that notion. What cannot be disputed is the horror and devastation the attack unleashed. Tens of thousands of people died instantly, and the effects of the attack continued to take a toll for years to come. Director Kaneto Shindô's CHILDREN OF HIROSHIMA takes an unblinking look at those lingering effects 6 years after the bombing through the eyes of school teacher Takako Ishikawa (Nobuko Otowa). She survived the bombing, although her parents and sister did not. Now Takako lives on an island with her Aunt and Uncle, and seems to be getting on with her new life quite well. For her vacation, Takako decides to return home to visit friends and see the graves of her family members. While in Hiroshima, Takako sees first hand the effects the bombing has had on those less fortunate than herself, in particular Iwakichi (Osamu Takizawa), a former employee of her father's who has been blinded and reduced to begging. Iwakichi also has a grandson who lives at an orphanage because the man is incapable of caring for the boy. We also learn the fate of three of Takako's pupils who survived the bombing, as well as the effects it had on her friend and fellow teacher Natsue (Niwa Saito). Much of the film is presented in a very matter of fact realistic style similar to Shindô's THE NAKED ISLAND. When the film depicts Takako's memories of the actual bombing, however, it veers into the more fantastical approach of Shindô's horror films like KURONEKO or ONIBABA. It's a stunning sequence of great power and visual artistry. Sure, it's a cliché to say that, “war is hell,” but when one character in the film says just that, it's hard to think of a more appropriate comment under the circumstances. Shindô's film is unapologetically anti-war, and if that means both Japanese and Americans are assigned some blame for what happened, then so be it. Even if you feel, as many Americans do, that dropping the bomb was necessary to save lives, it's hard to imagine any but the most jingoistic viewer being unmoved by the story Shindô tells here. 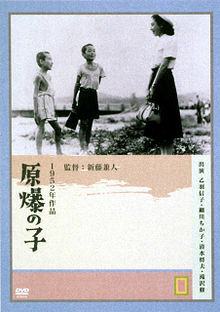 This year is the first time CHILDREN OF HIROSHIMA has been given a theatrical release in the U.S. It is also currently unavailable on home video in this country. That such a major work from a talent like Shindo, who at 99 years of age is still making movies, has been unavailable for so long is ridiculous. Don't miss your chance to see it. 3 1/2 out of 4 stars.